The fifth house from the ascendant is called house of children, good deeds in previous birth and power. These are the three main things we can know from this house. If the lord of the fifth house is exalted or in own house or in friendly house then the above mentioned things would be favorable to the native. If debilitated or in enemy house then would get unfavorable results. In north Indian charts, the house next to the fourth house in anti-clockwise direction is fifth house. From the natural order of zodiac sign marked in the ascendant, we can derive which zodiac sign is fifth house. 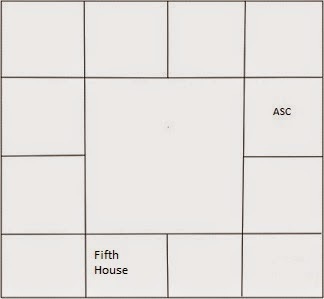 For example if the ascendant is marked with 4 then the fifth house would be Scorpio. 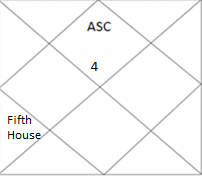 In south Indian chart, since the zodiac signs are fixed, the sign which is next to the fourth house in clockwise direction is the fifth house. In Uttara Kalamrita book, Mahakavi Kalidasa says, the below are signified by the fifth house.